The Roof Terminator® is designed to significantly reduce costs and labor associated with terminating roof membranes along a building perimeter. The system consists of a 24 ga continuous cleat, securely fastened to an installed nailer. The fascia cover snaps firmly onto the cleat, providing additional protection from moisture infiltration and improving aesthetic appeal. With no exposed fasteners and no spring clips, The Roof Terminator® can be used with most manufacturer’s roof membranes and is well suited for multiple system types including fully adhered, mechanically fastened, and ballasted systems in addition to SPF and other liquid applied roofs. 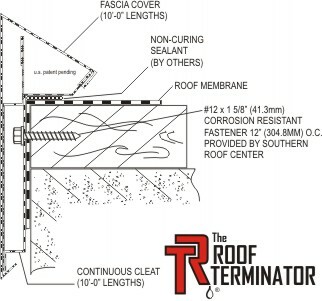 The Roof Terminator® can be custom manufactured for various fastening patterns based on nailer type and location. Our pre-engineered cleat design assures consistency, accuracy, and quality for your entire project. The building can be dried in long before color approvals are obtained. For future changes, the fascia cover can be removed and another color or finish installed without compromising the integrity of the installed cleat or roof system.